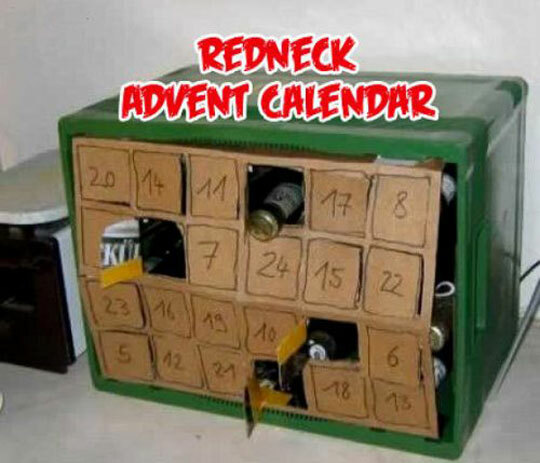 This is the third year that I’ll be doing an advent calendar for Mrs. Sip, providing her with a treat each day until Christmas finally arrives… then the treats stop and we spend the big day in separate rooms, Mrs. Sip reading one of her nauseating books, the Sip Advisor seeing how drunk he can get before noon. It really is a wonderful time of year. In all seriousness, this is a fun idea and it scores you some serious brownie points! I only offer this as a suggestion because frankly, I don’t like being out in the cold for hours watching marching bands, as much as the next heat seeker. It’s a great event for kids, I guess. They at least hold out hope until Santa finally shows up atop the main event float. As for myself, I’ll be inside my warm little apartment, snuggled under a mess of blankies, sipping on (not gin and juice) spiked hot cocoa, and pestering Mrs. Sip to lose her clothes and entertain me! This option might be available to all you little sippers, but whether you live near a Christmas Train or some other Christmas Wonderland, you should definitely make a point of visiting once. It’s an annual tradition among the Family Sip. We meet at Stanley Park, ride the train, check out the lights and then head off to our favourite restaurant White Spot for a healthy dose of burgers, beer, and other merriment! If you live where snow actually falls, then this is a great idea. If you don’t get the white stuff, you should probably avoid this idea, as you’ll just be playing with dirt. I can only remember a couple White Christmases (damn Vancouver’s mild temperatures) and you can bet when those happened, we were messing about in the snow and not all sheltered inside, afraid to go out into the open air as today’s little ones seem to be. I look majestic when on the ice… except for that one time in the U.K. when all you could rent was figure skates and having spent my entire life in a hockey boot, I wasn’t used to the toe picks and wound up introducing my face to a sheet of ice! Luckily, I wasn’t much to look at before my accident… some say the accident actually resulted in a slight improvement. To be fair, my knees took the entire brunt of the fall, keeping my mind intact to be ruined by alcohol! While I normally shun social gatherings with vehement disgust, I do find a way to fake it through the Christmas season. Mrs. Sip had to attend like nine parties last year. I matched her in nights I just sat on the couch and got blasted, but with her being so busy, we didn’t even have a chance to watch the Family Matters Christmas episodes I tracked down. I have a need for Urkel and that has yet to be satisfied. This is the only reason to have friends, am I right!? Hell, they don’t even have to be friends; they just have to be rich! I’ve written before about how we pull out our Roulette Shot Wheel and dole out shooters during our gift exchange. Usually we make the person who’s stealing a gift have to take a shot, but we usually end up ramping it up and also punishing the person who has just been stolen from… that’s the reality of life, my little sippers! What suggestions do you have for the Sip Advisor on how to spend the Christmas holiday? Clearly, you can see I’m going to be busy, but I’ll try to fit your advice in! This is a really simple recipe and a definite crowd pleaser. Before starting this project, I bartended one of Ma and Pa Sip’s Christmas parties and this drink was the hit of the evening. 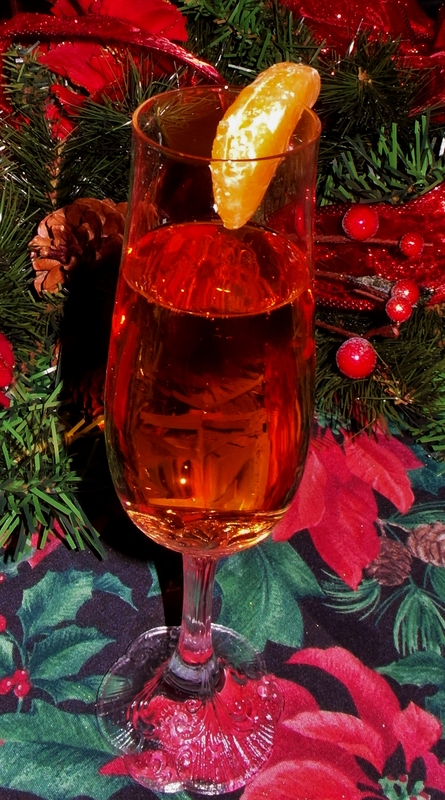 A Mandarin Orange Piece is the perfect garnish this time of the year and works well with a champagne flute. This entry was posted in Wine Cocktails and tagged Advent Calendar, Build a Snowman, champagne, Christmas Parties, Christmas Train, cocktail, cranberry juice, Family Matters, figure skates, Gift Exchange, ice skating, Mandarin Orange Piece, Poinsettia, Santa Claus, Santa Claus Parade, Secret Santa, Snowball Fight, Stanley Park, Things to do at Christmas, Things to do in Winter, triple sec, Urkel, White Spot by Daniel Wilson. Bookmark the permalink.